SabbaticalHomes.com member Debra Deliso enjoys her work as an actor, teacher, director and writer in the greater Los Angeles area. Home Sitting brings her across the vast city and helps inspire her work. When fellow SabbaticalHomes.com member, Michele Druon, contacted Debra for a Home Sitting opportunity, it inspired a friendship. Michele found Debra’s Home Wanted request for a quiet place in Pasadena on SabbaticalHomes.com. As a French teacher at Cal State Fullerton, Michele was off to France for 10 weeks in the beginning of fall with her students. She needed someone to care for her home and cat while she was away. Debra’s profile included not only her love for nature and animals, but also her passion for theater. Debra explains that it was Michele’s kindred love for theater that inspired her to make contact. Debra enjoys Home Sitting and thinks of it as a retreat. She says, “Because I’m a writer, it’s a beautiful experience to step out of my own home and into someone else’s. I get to enjoy a different perspective and tap into my imagination in a different environment.” She explains that another benefit of being away is forgetting about chores and to-do lists. While Debra spent the beginning of fall in Michele’s delightful home, she began writing a play. Without even knowing it, Michele influenced Debra’s writing. “There is a beautiful, inviting bookshelf in the home. I couldn’t help but pull out a couple of books and read them while I was there.” Debra explained that the books she had read in the home helped inspire her next play. Upon Michele’s return, the two met for dinner. They quickly got onto the topic of the theater. Michele exclaimed her passion for it and confessed that she had always wanted to perform. Debra encouraged Michele to join her acting class, explaining “It’s never too late, I have students from 18 to 80 years-old in my acting class.” Debra was delighted to share with us that this summer Michele will be taking an acting workshop with her. Debra is on faculty at the USC School of Theatre and The American Academy of Dramatic Arts. She also teaches small private classes three times a week at Throop Hall in Pasadena. Her classes foster a nurturing and safe environment. Besides learning alongside professionals, many of her students become good friends. To find out more about Debra’s acting classes, visit: debradeliso.com. Debra also serves as the artistic director for SAIPRO. The name is an abbreviation for Serving Artists In Process. Their mission is to help nourish emerging visual, literary and performing artists. 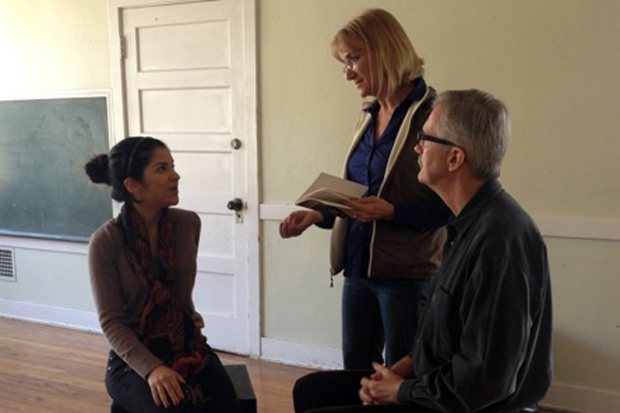 SAIPRO is a project of the nonprofit Pasadena Arts Council’s EMERGE Fiscal Sponsorship Program. Debra is registered as a Home Sitter with SabbaticalHomes.com, you can find her profile here. If you’re looking for a Home Sitter, begin your search here. A new friend might be just around the bend!